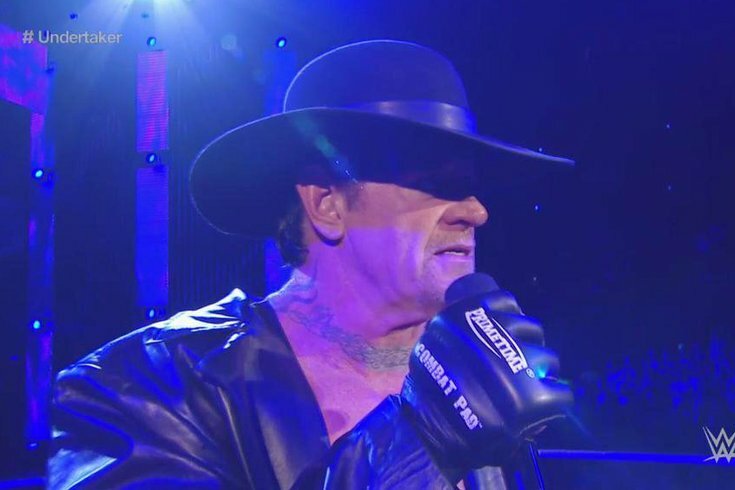 The Undertaker addresses Brock Lesnar Monday night on Raw. The Undertaker surprised everybody by making his return to WWE on Sunday night at Battleground and taking out Brock Lesnar during his WWE World Heavyweight Championship match against Seth Rollins. And The Dead Man surprised everybody again by opening up Raw with a promo directed to the man who defeated him and ended the WrestleMania streak one and a half years ago. The promo clearly signaled Taker’s reasoning for attacking Lesnar on Sunday night – he still hasn’t let the whole WrestleMania thing go. Storyline-wise, his vengeance against Lesnar makes sense, but a year and a half later? That part doesn’t make much sense. And it confused Paul Heyman as well. Later in the night, Heyman cut a promo on Taker and once he got a little too heated, the gong hit and the lights went out and when they came back on, Taker was in the ring alone with Heyman. That’s when things got really good. That Lesnar chord hit and he charged the ring and began brawling with The Dead Man. Security along with the roster hit the ring trying to separate the two, but this was one of those chaotic scenes that simply looked awesome on television. I love that Taker is healthy enough to really give it his all at this point in his career, and this segment truly reminded me of The Attitude Era. “I will kill you!” –Lesnar. “You’re gonna have to!” – Taker. Great stuff here. After a commercial break, the two once again brawled in the backstage area with other wrestlers trying to break it up. What we got out of this was the first match for Summerslam, being billed as its main event – Lesnar vs. Taker. Even though I’ve had enough of my fix of Lesnar-Taker, this segment alone sold me on a match between the two at Summerslam. Sure, I would rather have Lesnar as champion or involved in a championship match, but if those two behemoths bring it, we’ll be in for a hell of a match. WWE World Heavyweight Champion, Seth Rollins, cut a promo on still being the champion and one of the greatest ever. I have to admit, it’s pretty cool he’s still the champ in mid-July after he won the title in March. That’s some staying power. However, the United States Champion, John Cena, had to come and ruin all of that celebrating with a heartfelt speech on how Rollins is a terrible person and isn’t a real fighting champion to be proud of and he is. That’s pretty much it, and it fell kind of flat for me. Whether or not this match happens at Summerslam, I couldn’t care less. I don’t want to see Cena in the main event at this point unless he’s dropping the title to Owens. I still have a bad taste in my mouth from Battleground, and it’s getting worse. The main event saw a Six-Man Tag Team Match pitting Cena, Cesaro and Randy Orton against Kevin Owens, Rusev and Sheamus. I’m not too sure what WWE is trying to do with Owens now, but I have a very uneasy feeling that they’re once again cutting a superstar off at the knees that has a legitimate shot as supplanting Cena as the #1 guy in the company. Sheamus walked out on Owens, and then Owens walked out on Rusev. Lana came out and attacked Summer Rae. Rusev was distracted and then ran right into the Attitude Adjustment into the Big Swing into the RKO. OK, that spot was pretty sweet. But it still helped nobody involved. Rusev was beaten by three men, Owens quit on a match – again, and Sheamus looks like an idiot. There were many infuriating things about this main event that I just want to forget it existed. I just want to wake up the morning after Summerslam and see Rusev back on track and Owens with the United States Championship. This ending sucked. Bray Wyatt and Luke Harper have reunited, and their common enemy is now Roman Reigns. Harper, who attacked Reigns at Battleground, faced Reigns one-on-one on Monday night, and he wasn’t alone. Harper may have had Wyatt in his corner, but Reigns had The Lunatic Fringe, Dean Ambrose, in his. Not that it mattered much since this match never had a chance. After a fairly good match, Wyatt interfered and the entire thing turned into one big brawl. Something about brawls on this episode of Raw. Not that I mind. It was fun to watch. The Divas division had another great showcase on Monday night, as we were given two Divas matches – one singles match and one tag team match. Charlotte got the win over Brie Bella and the NXT Women’s Champion, Sasha Banks, made Paige tap out to her finishing maneuver, The Bank Statement. Two excellent matches and this is exactly what the division needed to be taken more seriously to not only the every-week viewer, but casual viewer as well. Big things are ahead for this division with the new crop leading the way. Even in the loss, it’s refreshing to see Stephanie McMahon and Triple H give the new divas props on social media. I really dug the backstage segment between Lana and Summer Rae, with an eventual appearance by Rusev. Rae, dressed to the gills in the same outfit Lana was wearing, pretty much said Lana could be replaced aesthetically for Rusev, and that’s pretty much how this segment went. Rusev appeared, didn’t give Lana one look until he kissed Rae in front of her, and then told Lana she didn’t look good. Rae then slapped Lana as they walked away. I enjoyed this because now I think when Ziggler comes back from his storyline throat injury, he’ll probably be more of a badass and that could only be good for his character. So at least The Straight Shooters show on Wildfire Radio will have some good stuff to talk about heading into Summerslam in August. Stay tuned for more information on that. •	Non-Title: Los Matadores d. Prime Time Players by pinfall via a Fernando backcracker on Titus O’Neil. The Prime Time Players were distracted by The New Day on the ramp, so I guess that feud isn’t over. • Big Show d. The Miz by pinfall via an elbow splash off the middle rope. Big Show kicked Miz around after the match and cut a promo on Ryback. •	Roman Reigns d. Luke Harper by disqualification after Bray Wyatt interfered. Reigns, Ambrose, Wyatt and Harper all brawled after the match. •	Sasha Banks (c-NXT) and Naomi d. Paige and Becky Lynch by submission after Banks locked on The Bank Statement on Paige and she tapped out. •	John Cena, Randy Orton and Cesaro d. Rusev, Kevin Owens and Sheamus via pinfall after all three faces hit their finishers on Rusev and Orton pinned him.